AOY leaders say all could change: Even after leading the Bassmaster Elite Series anglers in points for two consecutive events, Alton Jones and Terry Scroggins said Saturday that they aren’t ready to stake any claims in the Toyota Tundra Bassmaster Angler of the Year race. Jones, now the one setting that mark, has a streak going. In eighth place after one event, he took the top spot after the second event. His lead is the product of consistency: three consecutive final-day, Top 12 cuts. Any wind at Jones’ back may be the breath of Scroggins, who also has three Top 12s and is now 30 points behind Jones. “There are five events left and a lot of fishing to do, so being second doesn’t mean anything right now,” Scroggins said Saturday as the Alabama Charge on Pickwick Lake concluded. He said his mindset is not to shoot for the AOY leader, but rather to remain consistent. He has managed a steady-as-she-goes performance so far: 10th, second and eighth, respectively, in the first, second and third Elite Series competitions of the season. Both Jones and Scroggins are mindful of the anglers at their backs. 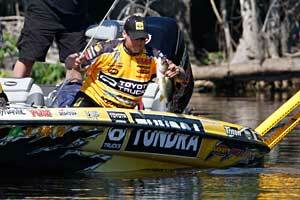 Not the least on that list is six-time AOY Kevin VanDam, who held on to the No. 3 spot Saturday. VanDam, the reigning AOY, was 80 points behind Jones, and 50 short of Scroggins. A new Toledo Bend: The Bassmaster Elite Series field was on Toledo Bend on Monday morning for the first of three days of practice for the TroKar Battle on the Bayou. The April 14-17 event will mark the halfway point in the eight-event regular season, and the halfway point in the 2011 Toyota Tundra Bassmaster Angler of the Year race. 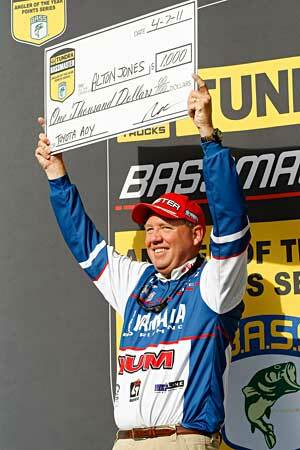 AOY leader Alton Jones, a five-time Bassmaster winner (including the 2008 Bassmaster Classic), said he last competed on Toledo Bend in 2003. Ditto for AOY runner-up Terry Scroggins, as far as Bassmaster events go. But any potential disadvantage may only exist on paper. Jones pointed out that fishing conditions at Toledo are so skewed from normal, he has just as good a chance there as anyone who competed there recently. “It’s about 8 feet low, so it will be a ‘new’ lake for me, just like for everybody else,” Jones said. Bonus time: Three bonus checks were awarded to anglers last week on stage at the Alabama Charge. $500 from Berkley to Jason Williamson for his 10-pound, 3-ounce lunker, the Berkley Big Bass of the Tournament. Lane second — again: “Second again this year!” Bobby Lane declared Saturday as the Alabama Charge winner, Davy Hite, weighed in. Lane was smiling, but he was obviously disappointed about being the runner-up for the second time this year. 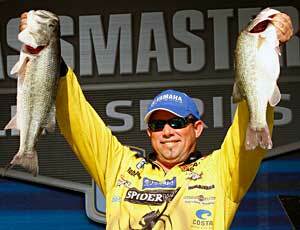 He also finished second on Lake Tohopekaliga in January at the Bass Pro Shops Bassmaster Southern Open. Lane said much of his catch came out of a shallow area of Pickwick Lake that held a lot of fish — and a lot of fellow competitors.